June 09 - After our holiday in May June was bound to be a bit of an anticlimax. We had visitors for two weekends and the rest of the time was occupied with work. We did have some very hot weather but as always in Britain it didn't last for too long. Over the winter we were fortunate to get our hands on a number of trees and although we did cut some of it at the time of bringing them down there were still some logs that needed cutting and splitting. Some wood becomes harder to cut and split as it seasons and so we couldn't wait until the autumn to finish the job. Our choice of a Sunday morning seemed sensible until it turned into one of the hottest days of the year. After a few hours of hard work we had finished the pile and loaded our respective trailers which then had to be emptied and the logs stacked in our wood barn. 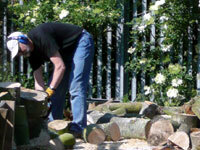 The photograph shows Steve with chain saw (hidden from view) in hand and a pile of cut logs behind him. Since he suffers from tinnitus he now wears ear defenders whenever he uses noisy equipment. 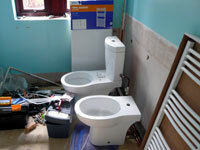 We've been planning to refurbish the downstairs cloakroom for some time. Our good friend Nick has agreed to undertake the work and he has reached the stage where he has removed the old floor tiles and re-laid the screed flooring. In the next month he will be laying new floor tiles, boxing in the pipe work, plumbing the new toilet, bidet and wash hand basin. It has been challenging to find the tiles we really like but we've finally got there. 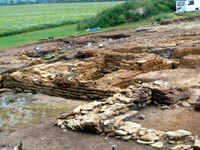 Jane has been a supporter of the Whitehall dig for a number of years and every summer when they open the dig for one month she tries to get there whenever she gets time off work however this year she had to cover for sickness at work so often there was very little time to spend at the dig. She did get to stick together part of a wonderful barbotene pot (may not be the correct spelling) that they dug up this year, you would not believe the intricacy of the designs on these 2nd/3rd century bowls that have been in the ground for1800 years. The Open day held at the beginning of July seemed to be a great success, the car park was full and plenty of spectators were crowding around the Roman soldiers bought in to perform for the day. One weekend we hosted the Flinders family. Matthew (son of Ian and Sue from Brisbane, Australia) and his wife Zoe who were on a tour of Europe. 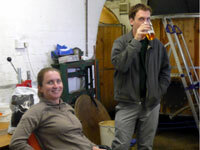 After several days in London and then visiting relatives in Somerset they came for some relaxation at the Pig Yard. We managed to find them some entertainment in the form of a tour of 78 Derngate before giving them an opportunity to meet Graham and Sue at the Frog Island Brewery. As always Graham gave them a taster of the beers - the picture shows Matthew enjoying a pint of Frog Island Best Bitter. Zoe was reluctant at first to try the beers but she soon got interested in the ciders and perrys that were available. Although not created at the brewery they are sold by Graham and Sue. We also took them on a walk around Salcey Forest which was where we often walked with Ian when we first got to know him 30 years ago. He introduced us as ex Londoners to the joys of the Northamptonshire countryside and all its flora and fauna. He helped us to appreciate different bird calls and the variety of butterflies that exist in the county. It was with Ian that we saw our first glow worms at Salcey. 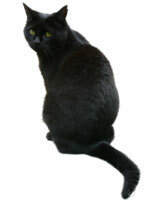 Our web pages should have a special area for our pets but it was omitted during one of the updates since October 2000. They rarely get a mention unless they come to a catastrophic (excuse the pun) end. This is Millie she is the younger of the two and at thirteen years old she still looks like a kitten. She is shy most of the time, even coy but has a look that invites you to engage with her and she then teases you by coming close enough to touch but rarely close enough to give a good stroke. Of late she has taken to howling downstairs in the middle of the night waking both of us up. Her other trait is to bring in mice still alive, let them loose and then get bored so although we have cats they have their own pet mice. 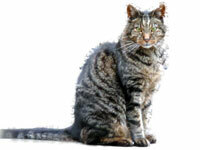 Murphy is the old man at 14 years old and is generally fit and healthy. He has this great look where he stares at you as if he knows exactly what you're thinking and at the same time sends a message that he thinks your an idiot for not having got life sorted. His life consists of sitting around a lot, watching the birds, catching the odd mouse and despatching them within seconds. Amongst his many foibles is the requirement always to have some dried food sprinkled on top of his meat, without it he won't eat. Towards the end of the month Jane's mum came to stay for the weekend. For this to happen Jane has to drive down to Barnet, collect her mum and then drive back. Jane doesn't like driving long distances so this is always a stressful challenge for her. Jane took her to Bedford to visit one of her old friends - all her friends are old now. 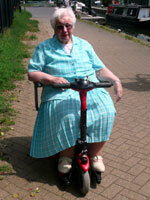 Another fun experience was for her to try this battery powered wheelchair which she wasn't too keen on. We took her to Beckets Park for a "stroll" alongside the canal. It's been some time since she has driven and the concentration proved to be exhausting. After about a quarter of mile out and another quarter of a mile back to the car she was quite wobbly on her feet. For an 87 year old she's doing very well - the power of medicine.